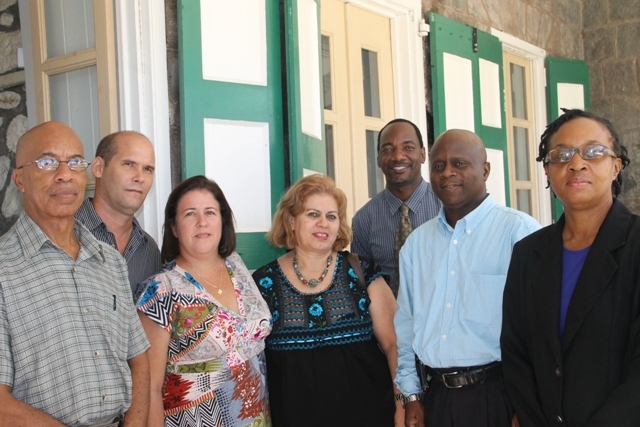 NIA CHARLESTOWN NEVIS (NOVEMBER 02, 2015) — A four-member delegation, from the Cuban Embassy in St. Kitts and Nevis, visited Nevis on October 30, 2015, to discuss with the Ministry of Health personnel ways in which the health sector could benefit from the long-standing relationship between St. Kitts and Nevis and find ways in which Cuba could provide greater professional assistance to the island. The delegation was headed by wife of the Ambassador and First Secretary in the Embassy of Cuba in the Federation Teresa Toranzo Castillo. She was accompanied by Officer in the Ministry of Health in Cuba in charge of Cuban doctors and nurses Michele Santana Iglesias, Head of the local Cuban Brigade Yail Pérez and Secretary/Translator at the Embassy of Cuba in St. Kitts and Nevis Winston Hanley. While on Nevis, the team paid a courtesy call on the Premier’s Ministry at Bath Hotel and met with Permanent Secretary in the Premier’s Ministry Wakely Daniel and Assistant Secretaries in the Premier’s Ministry Kevin Barrett and Angela Scarborough. In brief remarks, Daniel welcomed the delegation to Nevis on behalf of the government and people of Nevis. He said he was mindful of the long-standing relationship that the people of Nevis enjoyed in particular those who had studied in Cuba and returned to contribute to the development of the island and to the Federation of St. Kitts and Nevis. Daniel also expressed hope that the bond of friendship would continue far into the future and grow stronger. The Head of the delegation underscored the good relationship shared between Cuba and St. Kitts and Nevis and pointed to the cooperation in the areas of export, health, education and culture. She said, at present, there were medical professionals working at the Alexandra Hospital and at health centres on Nevis and also other Cuban residents who are contributing to the development of the island. Meantime, Iglesias who is in charge of Cuban medical doctors and nurses in 54 countries around the world said the relationship and collaboration with the Caribbean was among Cuba’s greatest priorities.